I came across the idea of the “Birthday Book” just before my oldest daughter’s first birthday. I was a new mom and wanted to start a family tradition of giving Lucia an annual gift that she would treasure as she grew older. The idea of the “Birthday Book” is to give your child a book on her birthday that reflects her interests and personality at that age. By the time she turns 18, she will have a shelf of books that represent who she was at each age. At 8 and 6, Lucia and Elina enjoy rereading the letters written on the inside cover of their birthday books almost as much as they love the books themselves. They serve as love letters from me; a memento of who they were at each age. Selecting the birthday book requires time and care. I consult my librarian, literacy and parent friends and the experts at my local bookstore. I spend hours hunkered down in the picture book section of that bookstore perusing staff recommendations, authors and topics the girls love. I sometimes consider books that I enjoyed at that age. Most of the time I get the book just right but I have had a few misses. It doesn’t matter, my daughters will come to enjoy the book at some point and at the very least, enjoy reading my reasons for selecting it. 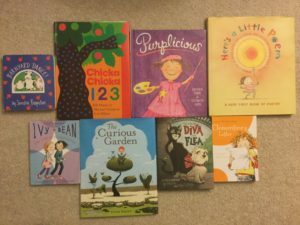 When the idea to blog about the birthday book came to me, I headed straight to our many bookshelves and began searching for the books I have gifted so far. Once I found them all, which in some cases took some effort, I laid them out chronologically. I read one after the other, both book and letter, and I realized that they serve as narratives of my daughters’ lives. Memories came flooding back! When Lucia was 4, she loved to sing so I went with a book of poems that my good friend and school librarian recommended. Birthday book number 6 is The Curious Garden by Peter Brown because Lucia shared so many qualities with the main character. Both are nurturing, confident, and bring light and beauty wherever they go. Mo Willems is one of our favorite authors so I was immediately drawn to The Story of Diva and Flea for her 7th birthday book. When I discovered that the story takes place in Paris, the city where I spent my junior year of college, I knew it was a perfect choice. Reading this book together is an opportunity to share a part of my story with my daughter. At 2 Elina loved balloons so that year I have her Pip and Posy and the Big Balloon by Axel Scheffler. I remembered her second birthday party when she paid no attention to her gifts preferring to play with the balloons instead. 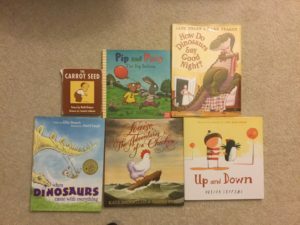 Elina’s enduring dinosaur phase is evident by How do Dinosaurs Say Goodnight by Jane Yolen, illustrated by Mark Teague at age 3 and When Dinosaurs Came with Everything, by Elise Broach, illustrated by David Small, the following year. Up and Down by Oliver Jeffers made birthday book number 6 because Elina loved two other books by the author and illustrator. Also, like the main character, Elina is a true blue friend; always ready to catch others when they fall. Looking over their individual piles of books reminds me how different my daughters were at each age. Lucia was a giggling, active baby, Elina more thoughtful and reserved. In many ways, these traits are still evident today. Lucia is the first to jump into a situation whereas Elina sits back, takes it all in and then acts, maybe. The birthday book is always the first book my daughters open on their birthday. On birthdays that fall on school days, it is the only gift they open in the morning. The others wait until after school. It is a treasure. They have come to expect it and tear off the wrapping paper, anxious to discover my selection. Before they read it, they ask me to read my letter. They love hearing about my thinking when I selected the book. Every time we read the book, they ask me to read the letter first. They know the love and care that went into selecting the book. They recognize it as a precious gift. This tradition is also a gift for me. I enjoy rereading the books and my letters almost as much as I enjoyed selecting and writing them. It enables me to hold onto my daughters at each age and see the journey of the girls they have become. Giving our students the gift of books: Bringing this tradition to the classroom? As I looked over my daughter’s stacks of book, I wondered: What if a teacher took this idea and applied it to the classroom? What if a teacher selected a special book that reflected her students’ interests and personalities, wrote a letter explaining her choice, gift wrapped it and presented it to her class? Imagine the excitement! Think of how powerful it will be for students to know that their teacher took the time and care to select the perfect book as a gift! It doesn’t even have to be a new book. Maybe it is a book in your library that you notice has received little attention but that you suspect your children will love. Perhaps the book finds a special home in the classroom library, in a bin labeled: “Our Special Gifts”. This will help you avoid my experience of having to search for the birthday books on our many shelves. The stacks of books will serve as a celebration and vehicle for teacher reflection. Just as I see my daughters’ identities reflected in their books, you too can look at the stack from one year’s class to the another’s and recognize the distinct personalities of your students. My wish is for all children to see books as gifts. My wish is to see the wonder and excitement in their eyes that I witness in my daughters’ faces on their birthday mornings. My wish is that they feel special knowing that the book was selected just for them. Imagine what a positive impact this tradition will have on classroom culture! Do you have any ideas on how to make books a gift in your classroom? Let us know! This is such a beautiful idea. The memories you have of your children and the reasons you chose each book are amazing things for them to hold on to as they grow. I love the idea of the Birthday book. I will have to remember this if I ever have grandchildren and start it with them.